Grand Canyon of the South. The Virginia Tourism Corporation today launched Ten Getaways to Feed Your Life Force for adrenaline junkies and ecothusiasts looking to push their passion for outdoor adventure to new heights. 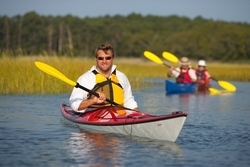 The getaway ideas, along with video of ecothusiast Dave Burden, an outdoor outfitter on Virginia's Eastern Shore, are featured on http://www.Virginia.org. Get the adrenaline pumping at Breaks Interstate Parks - the "Grand Canyon of the South." Spanning the Virginia/Kentucky border in Southwest Virginia, "The Breaks" is one of two interstate parks in the nation. Class IV-VI rapids on the Russell Fork River run through the park, making for some of the best whitewater rafting on the East Coast. The 4,500-acre park features a 12-acre lake, hiking trails, horseback riding, mountain biking, fishing, camping, cabins and tons of outdoor adventure. Explore the beauty of Virginia's Blue Ridge Mountains from Abingdon to Damascus along the Virginia Creeper Trail, one of America's favorite rail trails. Ride or hike at your own pace along a level, 15-mile trail, bordered by fields and pastures. Or push your passion along a more challenging, 18-mile trek, inspired by spectacular mountain scenery. Virginia Beach is an adrenaline junkie's dream. Bike, blade or walk the 3-mile ocean boardwalk to soak in the sun and sea air. Challenge your skills with the new craze of Stand-Up Surfing in Sandbridge. Kayak with dolphins in the Back Bay National Wildlife Refuge. Or soar with the gulls on a parasailing trip over the Atlantic Ocean. Reconnect with nature along the Virginia Birding & Wildlife Trail, where northern gannets, red-tailed hawks, pelicans, snowy egrets and bald eagles fly. Virginia is the first state with a statewide birding and wildlife trail system where nature lovers will find 400 species of bird, 250 species of fish and 150 species of land and marine animals. For travelers hooked on fishing, catch your passion in Virginia. Hire a guide for an unforgettable fly fishing trip in Virginia's mountain streams. Virginia's beautiful lakes and rivers in the piedmont region are havens for largemouth bass and other panfish. Along the coastline, charter a boat and head out for a chance at big stripers, tuna, cobia and drum. Several restaurants in Virginia Beach will even cook your catch for you. Virginia State Parks are consistently voted as America's best and grace almost every corner of the Commonwealth. Virginia's 34 parks have thousands of camping sites, hundreds of cabins and more than 500 miles of trails. Special ranger-led programs offer fun, hands-on learning opportunities for adults and kids - from astronomy to an "owl prowl." Virginia State Parks are pet-friendly, so families can bring their four-legged nature lovers too. Bug out in Southern Virginia at the John H. Kerr Reservoir/Buggs Island Lake. The lake is Virginia's largest, boasting 800 miles of shoreline to indulge adventurers' passions for water-skiing, fishing, sailing and swimming. Dock your boat at the lake or enjoy the camping sites. Virginia's underground holds great adventures too, especially in world-renowned caverns. Hike with guides through these mesmerizing destinations, found mostly in the Shenandoah Valley and gaze in awe at the world's only Stalacpipe Organ at Luray Caverns or the breath-taking Rainbow Lake at Shenandoah Caverns. Don't be fooled by the name, the Dismal Swamp Canal Trail in Chesapeake is an extraordinary outdoor destination. The multi-purpose trail runs 8.5 miles along the Dismal Swamp Canal and perfect for horse owners, bicyclists, walkers, joggers, and boaters. It's a natural and historical playground for serious and casual outdoor recreation enthusiasts. For travelers ready to feed their life force, check out http://www.Virginia.org for more outdoor adventure passions and watch Dave Burden and his dog Chinook as they kayak the waters of Virginia's Eastern Shore. Or call 1-800-VISITVA to request a free Virginia is for Lovers - Live Passionately travel guide.